Hey guys. Shhh. Don’t be loud. There’s a baby sleeping in here. My friend asked me to come over and watch her while she runs to a doctor’s appointment. Little Miss Mirabel June is looking cozy in her pale pink cocoon. All I can see of her is her sweet pink face. I wonder what two-month-olds dream about. I bet they dream about food, but not the kind of food that I like to eat these days. Definitely not coleslaw. I never ate coleslaw as a kid so it’s a novelty to me now. I always avoided the mysterious mayonnaise-laden salads at potlucks (what was hiding under there?). Looking back, I suspect that I missed out on a few wonderful slaws and a lot of terrible Jell-O salads. Oh well. Coleslaw got my full attention on a warm night this summer. A few friends and I drove to Justus Drugstore, a family-owned, former-drugstore-turned-gourmet-restaurant in a quaint town outside of Kansas City. We sat on the patio, which has a more casual menu than the inside. Three swanky cocktails later, our food arrived. My veggie burger came with a side of coleslaw. I took a bite and my taste buds did a little happy dance. That slaw was something else. It was crisp, fresh, tangy and sweet all at once. It teetered on the border of being too sweet or too tangy but never fell off the edge. It was perfect. I’ve been obsessed with recreating the Justus coleslaw experience ever since. I called and asked the hostess to read the ingredients off the menu for me (house-made pear cider, vinegar pickled celery root, ginger and pickled carrot), but their slaw didn’t seem feasible for home cooks. I’ve since made bowls and bowls of vinegar-based cabbage coleslaw but none satisfied like the Justus slaw. The other day, I noticed two of my real-life friends tweeting about a salad, so of course I had to know more about it. It was a Brussels sprout and arugula salad with honey mustard dressing at The Mixx, one of my favorite places in town. Being me, I had to try the salad immediately. While I was happily chomping away on that giant Brussels salad, it occurred to me that shredded Brussels would make a great substitute for the finely shredded celery root in the Justus slaw. Then it occurred to me that a nice, emulsified mustard dressing would be creamy, almost like mayonnaise. Bam! This salad was born. 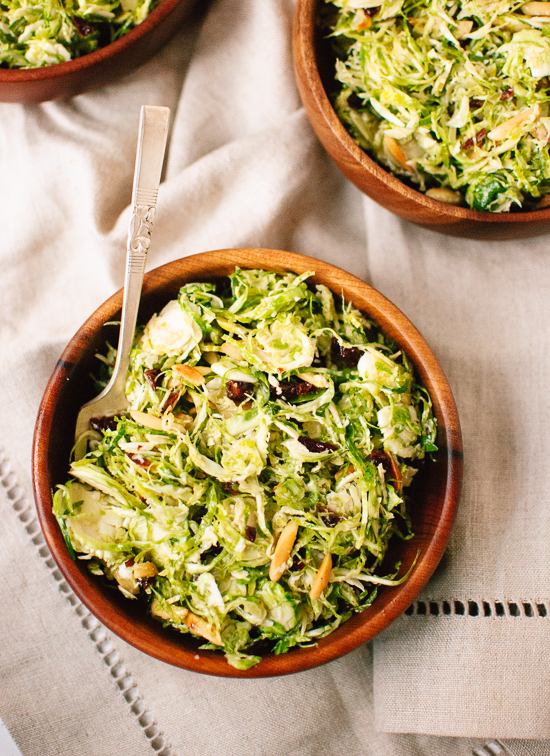 This delicious slaw recipe features crisp, shredded Brussels sprouts tossed with tangy honey mustard dressing, toasted almonds and dried cherries (or cranberries). 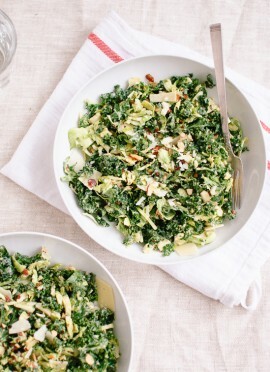 This is a great gluten-free salad or side dish, perfect for potlucks or holiday meals. Shred the sprouts: First, cut off the tough ends of the sprouts and any browning outer leaves. Then shred them in a food processor using the slicing blade, pressing the sprouts against the blade with the provided plastic pusher. If you don’t have a food processor, slice them as thinly as possible using a sharp chef’s knife, then give them a few extra chops for good measure. If you are using raw almonds, toast them over medium heat for three to four minutes, stirring frequently, until they are fragrant and turning golden on the edges. Whisk together the olive oil, vinegar, honey, mustard and garlic until emulsified. 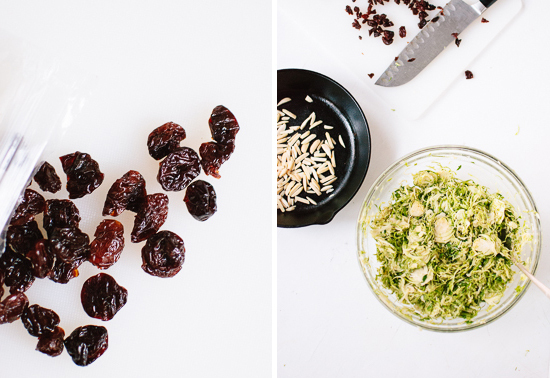 In a medium serving bowl, toss the shredded sprouts with the almonds, chopped dried fruit, Parmesan and dressing. Serve. 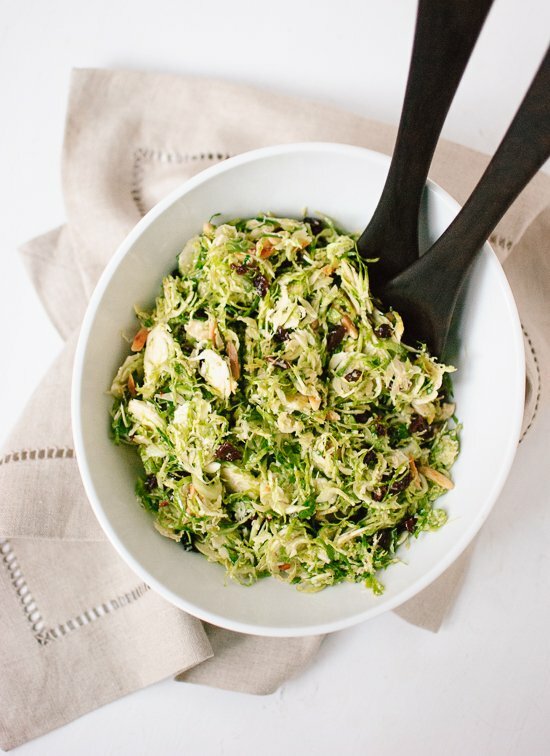 Recipe inspired by the Justus Drugstore patio’s coleslaw and the seasonal Brussels sprout salad at The Mixx. Make it vegan: Substitute maple syrup or agave nectar for the honey and skip the Parmesan. Mixing a little bit of white miso into the dressing could help make up for the missing Parmesan (scale back on the salt, since miso is salty). Or, try adding a light sprinkle of nutritional yeast. Storage suggestions: This salad is best consumed within a few hours. Store leftovers in the fridge, covered. The edges of the sprouts might brown lightly over time. Wake up leftovers with a little sprinkle of salt and a tiny splash of vinegar. Coconut bacon would be a great addition to this salad! 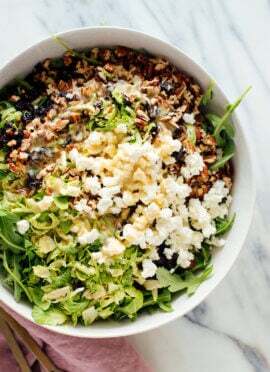 If you love this recipe: You’ll also love my roasted brussels sprouts with cranberries, raw kale and Brussels sprouts salad with tahini-maple dressing and Deb’s kale salad with apples, cranberries and pecans. Make it nut free: Omit the almonds, and perhaps add pepitas or sunflower seeds if desired. Clearly it’s Brussels Sprout season because every blog has a recipe with it. :) I love it! They are my favorite. I made something similar to this for Thanksgiving last year and it was a huge hit! I love brussels sprouts! This looks like a delicious way to celebrate them this season! Yum! It’s not cheating to use the bag of Trader Joe’s grated Brussel Spouts. I buy they all the time and make both hot and cold wonderful dishes from them. YES! I’m wondering if I shredded the brussel sprouts in advance (mandolin? I don’t have processor) and keep dressing seperate if I could take this to my father-in-law’s for Thanksgiving. :) Otherwise it will just be pre-packaged mashed potatoes and jarred gravy. Hey Claire! I think you could do that. A mandolin should work great. The edges of the Brussels brown over time but I suspect it’s due to the dressing. Let me know how it works for you! I just took this to a work potluck today. I called it “Winter Slaw” because we have some veggie haters here. Everyone LOVED it and then were shocked when I told them it was ALL Brussels Sprouts. Of note, I brought the dressing separately in a small Tupperware and poured it on the salad immediately before serving. Whole grain Dijon adds a lovely texture. Thank you Kate – I will keep this one in my arsenal of quick, delicious, nutritious, crowd pleasers. What a hit! Thank you for this nice recipe. Have a great weekend. I just looked up that Huitlacoche Agnolotti. It looks amazing! It also sounds more complicated than a raw brussels salad, too. Gorgeous! 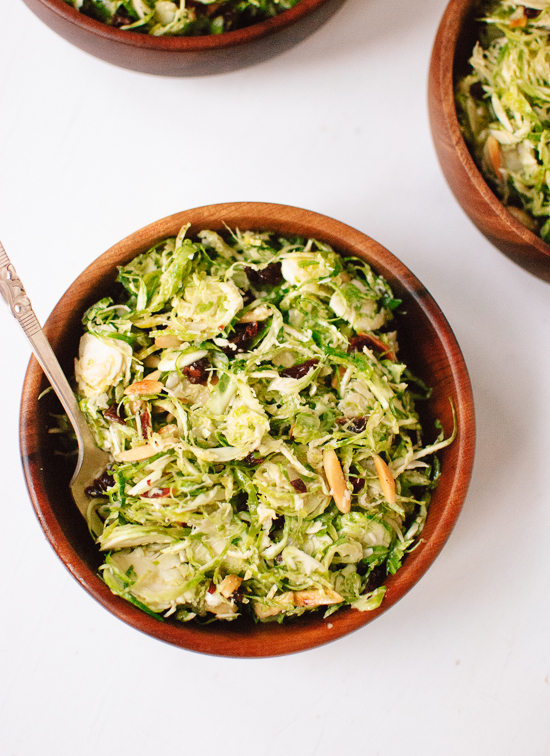 I loooove Brussels sprouts – genius idea to use them for slaw. I just ate The Mixx salad for dinner and then saw this post. Can’t wait to buy some Brussels Sprouts and make this! Oh man, do I love Brussels Sprouts, and how you’ve used them here is just awesome. Unfortunately it’s never cold enough here (Australia) for them to get the frost they need to be really delicious, but I’m sure your awesome recipe has the potential to ramp up even mediocre sprouts! Oh, that’s a bummer! I had no idea. Let me know if you give the slaw a try! This looks like the kind of slaw I’d love, especially with a honey mustard dressing! I love raw brussels in slaw! I like it waaaaaaay more than cooked brussels. That crunch is to die for! I think I might make this for Thanksgiving. This looks so good, just picked up brussel sprouts from TJs last week. Love the addition of mustard, never seen anything like it. I made this salad for a dinner party tonight and it was a huge hit! No one could believe brussels sprouts could be so tasty. Thanks for another great recipe and congrats on quitting your day job…keep up the good work! Thanks, Lindsay! Glad you all enjoyed it! I love doing Brussels slaws instead of cabbage slaws. Although, they are kind of like mini cabbages anyway? The honey mustard dressing is what’s reeling me in. I could drink it. Yep, pretty sure Brussels are just little bitty cabbages. Cute! I just made celery root into a consistency of a hummus but I can’t wait to try it shredded like this! Thanks for your inspiring combination creation. Happy Nesting! I’ve long been a fan of brussels sprouts sautéed with a maple dijon dressing, and this slaw looks like it would be just up my alley. I love the combination of sweet and salty flavors with the perfect crunch of the brussels sprouts, and your idea to add coconut bacon would really take it over the top! Those sautéed brussels sound so good! I love making honey mustard dressing but I’ve never tried making brussels sprouts into a slaw! I’m adding this to my list! This slaw is speaking my language! I love raw brussels and the dressing sounds perfectly tangy. Hello Thanksgiving side dish? Yes! This slaw would be such a great, light and fresh Thanksgiving dish! I love brussels sprouts in the fall time and this is so perfect for the holidays! Is it okay that I’m gleeking just thinking about this?! I made this tonight subbing agave for honey and we polished it off! My 11yo daughter had THREE helpings. Thank you! That’s so great! Thanks for commenting! I’m pretty sure I saw you that night at Justus. Just moved back to KC after 9 years in Brooklyn, NY, and was worried about finding good food! Justus was seriously the best meal of my life. I’d love suggestions for where to eat and food shop in KC! Anyway, this salad looks great! Did you really?! I was with two tall guys and a girl with curly blond hair. I have an enormous list of places to eat in KC… I’ll email it to you next! 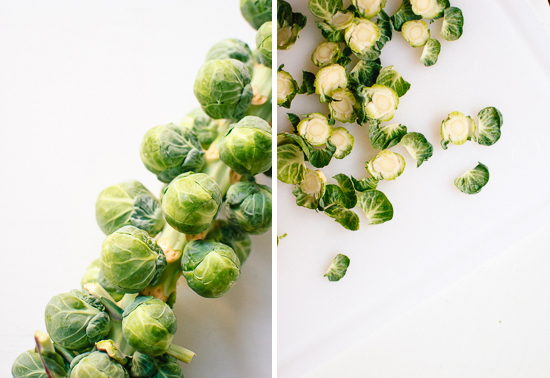 Love this creative way to use brussels sprout. I always have had them roasted. I’m adding this recipe to my “to-make” list! This looks so delicious! I am making a red autumn slaw this evening but will make a note of this for next time. What an interesting combination! I’m looking forward to making a raw vegan version of this, with raw almonds, and perhaps pomegranate arils in place of the cherries or dried cranberries, and a raw nut cheese. Your photos are gorgeous. Are those pieces of purple cabbage in one of the photos? No, no purple cabbage. Maybe you’re seeing the dried cherries? Please let me know how the raw/vegan version turns out! I made this last night thinking it would last for a few work-week lunches…but no! My roommate and I ate it all for dinner. I chopped the sprouts by hand, and it wasn’t too labor-intensive. Glad you both loved the slaw! Also glad that you didn’t mind chopping the sprouts by hand. Trader Joe’s sells shredded sprouts if you have access to a store/want to take a shortcut next time. This sounds yummy AND easy :) I’m going to make it for my work potluck tomorrow–I’ll let ya know how it goes. I’ve never used the shreddy thing on top of the food processor, so that sounds exciting ;) And by the way, the Mixx was my favorite food place we went to in KC! They need to franchise up here!! This was a hit! And it was so easy, even though I ended up chopping the sprouts by hand–2lbs of sprouts mind you, since I doubled the recipe :) Nothin’ like choppin’ sprouts at 6am! haha! Yes! That’s a lot of early morning chopping. Glad the slaw was worth the effort! I had to work this Thanksgiving – it’s the first time I haven’t been home in Virginia, and a good friend of mine invited me to join her at her family’s celebration this year. I brought this dish along, and it was such a huge hit that her family applauded me at the dinner table! I just wanted to say thanks for sharing this one – loved it. Devon, thank you so much for your comment. It really brought a smile to my face when I read it last week. I’m glad everyone enjoyed the slaw! I made this for Thanksgiving dinner last night and it was DELICIOUS! Thank you! So glad you enjoyed the slaw! Thank you for commenting! I would have loved your extra garlicky version. Just made this. It is undoubtedly great. Thanks so much foe the recipe. Thanks, Charlotte! Glad you loved it! Just checking — do you cook the sprouts? I’m a huge fan of roasted brussel sprouts with olive oil, salt and pepper, and a bit of truffle oil to finish but I’ve never used them raw. Nope, don’t cook the sprouts. If you think about it, most slaws are made with raw cabbage and brussels sprouts are just tiny cabbages. The vinegar in the dressing breaks down or “cooks” the cabbage a little bit. If you like slaws and Brussels sprouts, I think you’ll love this recipe! This has become my new favorite side! It is perfect for warmer weather and I LOVE the fact that it does not use mayo. Thank you!! Made this last night and just wanted to stop by and say “Yum!” What a great way to mix up regular slaw or other boring sides. Glad you enjoyed the slaw, Sarah! I just posted an Asian spin on this slaw that you might enjoy, too. I love brussels sprouts, never thought about making them a salad raw. I love that you made this with cranberries, and the honey mustard dressing just really sent me over the top. Thank you, P.! I’m glad you enjoyed the brussels slaw. 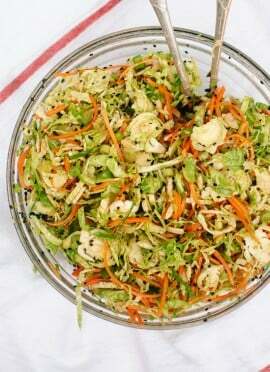 I have another brussels slaw with Asian flavors that you might like, too! I brought this to a work potluck today and it was perfect! I read your notes about not storing well so I prepped it ahead of time – and just poured the dressing on right before I served it. Huge hit! Glad to hear it! Thanks, Leah! Thank you for this little gem! It’s something different and it’s delicious! Thank you, Tiffany! Glad you enjoy it! 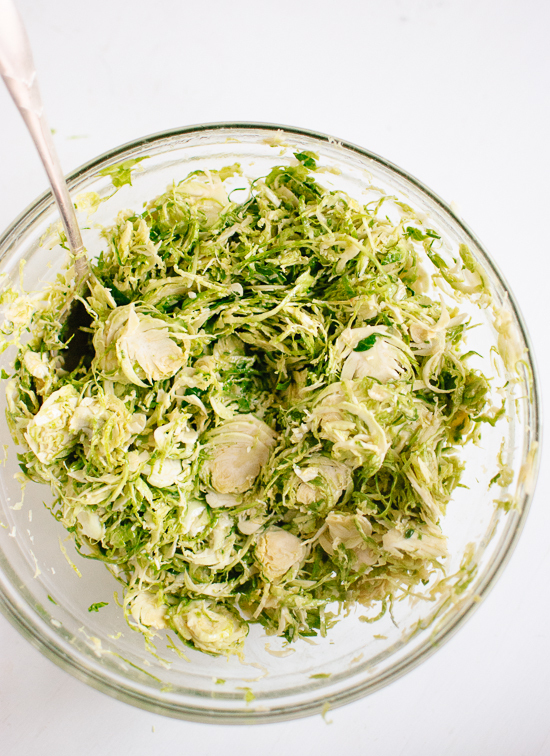 I never liked raw brussel sprouts… until I found this recipe and made it. Just stopping by to say thanks for this recipe! Made it for a BBQ potluck and people loved it. I will be trying some of your other recipes soon! Thank you, Jess! So glad you all enjoyed it! Made this for a beach potluck, and love the simplicity! I didn’t have cranberries so I used diced apricots and tart cherries. Yum! We only rarely get brussel sprouts here but the dressing seems to work equally well with cabbage. Thanks! Thanks for such a reliable, delicious recipe! I’ve made this recipe 4 or 5 times – it’s been amazing every time. Was just looking it up again to make next week for Thanksgiving. Trying to ease my dad back into Brussels Sprouts – he claims he has sprout-related childhood trauma. I think raw with this delicious dressing might be the way! I think I’ll add a bit of crumbled bacon to make it more appealing to him. whoops, forgot to rate it above! Brought this to an extended family gathering for Thanksgiving 2015. A lovely light & healthy counterpoint to the meal. It was a HUGE hit with the adults. My nephew “taste tested” the dressing before I added it to the slaw and went back for a second tablespoon before it even got added to the sprouts. I used slightly less olive oil proportionately but followed your excellent directions exactly otherwise. Using the Cuisinart meant a double recipe was super fast to put together – I just changed the blade and shredded the Parmigiano Reggiano without having to wash the bowl. Next time I’ll try the Coconut Bacon too. Thank you! Thank you, Claire! I’m glad this slaw was a hit. Great idea to shred the cheese in your food processor, too! Made this today, recommended by emmaslittlekitchen.com, thank you ladies. Great hit with sprout hating husband – now a sprout loving convert! Hooray! Glad to hear you converted your husband to sprouts with this slaw. Love this recipe! What do suggest serving this with if I’m just making it for a week night dinner? Made this tonight using pomegranate seeds vs cranberries. I absolutely love the presentation. I found using the food processor worked well for shredding the sprouts and saves time- especially if you’re doubling or tripling the recipe for a family gathering. My favorite is roasted brussel sprouts, but I’m probably going to make this slaw for thanksgiving to ease the brussel sprout haters into trying something new. With a little more dressing, this recipe is right on. Love this recipe so much! My man loves to smoke meats and this is a great substitute to the old fashion creamy cole slaw. Thanks for sharing! This was amazing! Served at Christmas dinner and everyone loved it. Will be making this one again and often. Thanks! Well, I haven’t yet made this, but my sister did! She brought a double recipe of it last night (made with dried cherries) to my annual post-Christmas letdown party. It was so delicious that I asked her to leave me some, and today I ate it for both lunch and dinner. And now I am pinning it and planning to make it myself very soon. Thanks for the great recipe! Ever since my boss showed me this recipe a few years ago (can’t believe it’s been that long already), I’ve been addicted making it when brussel sprouts are in season! Anytime there’s a potluck or a crowd to impress, this is a great recipe to use. Thank you so much for sharing! Thanks, May! This one has a reputation for being a crowd-pleaser. So glad it’s come through for you! Yummy! I added scallions, radishes and broccoli stems cause I had them. I love Slaws!!!! Mind if I add this to my little website, linked to you of course! Yes! You can certainly include it on your site, just be sure to follow my photo and recipe policy. I don’t allow the ingredients or directions to be copy + pasted, so a link back to this page would suffice. Thanks so much! Would yellow mustard be good if you don’t like dijon mustard? I just don’t like the horseradish in it. I haven’t tried it myself, but I think that should work fine! For those vegans among us, would this still work with maple syrup isntead of honey? 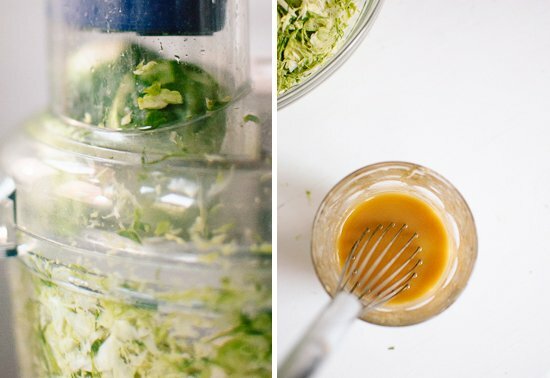 Your Honey Mustard Brussels Sprouts Slaw is the BEST! I tried it for a new Thanksgiving dish and became the favorite! I keep the recipe taped inside my kitchen cabinet door for quick reference. It’s DELICIOUS–and I don’t like brussels sprouts. Well, in this slaw I do! Your recipe is in demand now! Thanks, Kate! Thank you, Linda for sharing and for your star review! I have made this five times for guests and it is my most requested recipe, so easy w the 2mm Cuisinart slicing blade. I love your recipes! A friend of mine mentioned your recipe to me just this afternoon. She said that it must be eaten soon after making, otherwise the Brussel sprouts turn an unappetizing brown color. I would love to make this recipe, but I need to make and HOLD it for a day. Might blanching (quick steam blanch in microwave then plunge into ice water) help? Maybe you have another tip? Yes, it can. This salad is best consumed within a few hours. Store leftovers in the fridge, covered. The edges of the sprouts might brown lightly over time. Wake up leftovers with a little sprinkle of salt and a tiny splash of vinegar. Made the salad this week according to the recipe. I used low sugar cranberries. It was amazing. I will certainly make it again. Next time, I will reduce the olive oil to 3 T. as it seemed a little too much. Thanks for posting. Wonderful, Phyllis! Thanks for the review. A very delightful salad. Goes well with fajita’s. I doubled the dressing recipe. It was fabulous!!! Made this for Thanksgiving and it was sooooo good. Someone even said they don’t normally like brussels sprouts but they loved this. I used a mandolin to shred them, and I ended up adding extra almonds and cranberries. Definitely saving this recipe for next year! Hooray! That’s a win. I’m glad you loved this, Michelle. Very tasty! We added some goat cheese. Will definitely make again. I love goat cheese in almost anything! Thanks for sharing, Suzy. Made this recipe was very delicious, but i needed to double the volume of the dressing. Thank you for sharing! I’m glad you liked it.